Dr Jane Barton’s is the face we are getting to know. 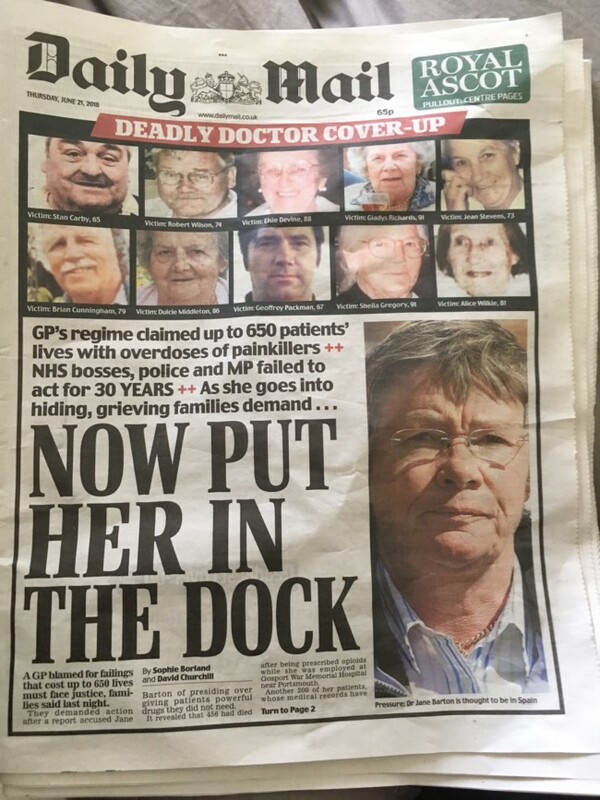 The Mail leads with the demand “PUT HER IN THE DOCK”. On what charge? 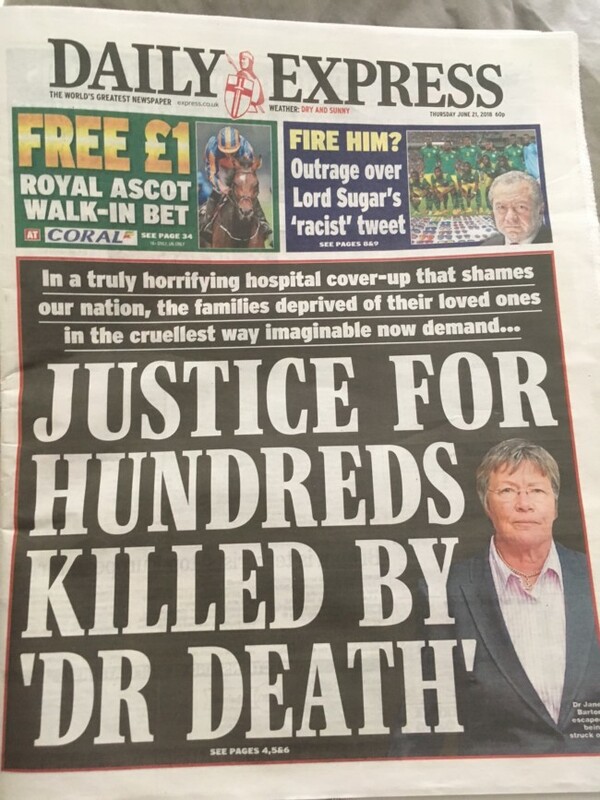 The Express demands “justice for hundreds killed by ‘Dr Death'”. 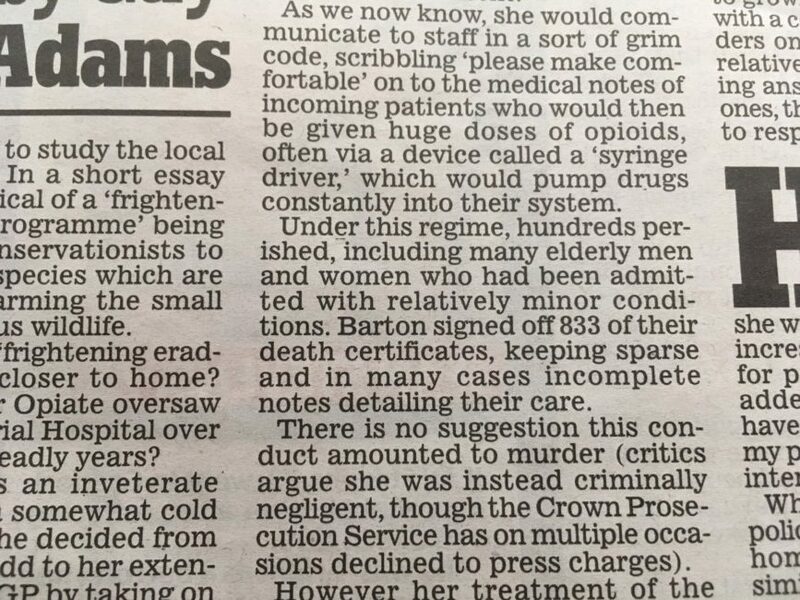 Dr Barton, dubbed ‘Dr Opiate’, is “blamed” for failings that costs up to 650 lives at Gosport Memorial Hospital. The dead were aged 62 to 99. the saying is true: if you want to be invisible, go grey. A report “accused” Dr Barton of “giving patients powerful drugs they did not need”. The number of dead is staggering: 456 people died after being prescribed opioids “without medial justification”; the records of 200 more have gone missing. The Mail guesses that “they probably suffered a similar fate”. Who needs fact when you’re talking about life, death and justice? Dr Barton worked at the hospital between 1988 and 2000. The deaths making news occurred between 1987 and 2001. 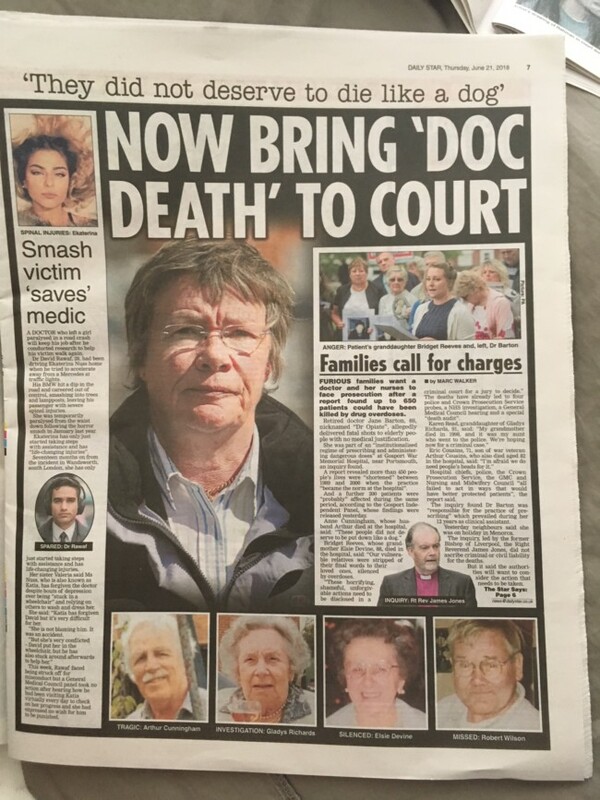 The report by the former Bishop of Liverpool James Jones does not mention her alone. His report is, says the paper, “scathing” about senior consultants, nurses, pharmacists and managers at the Hampshire hospital. None of them are pictured in any newspaper. The dead have been the subject of reports, three police investigations, two reviews by medical bodies and 11 inquests. Nurses raised concerns decades ago. And not a single criminal charge has been levelled at anyone. The word conspiracy is flung around. Its reach extends to scores of people. But is it valid? 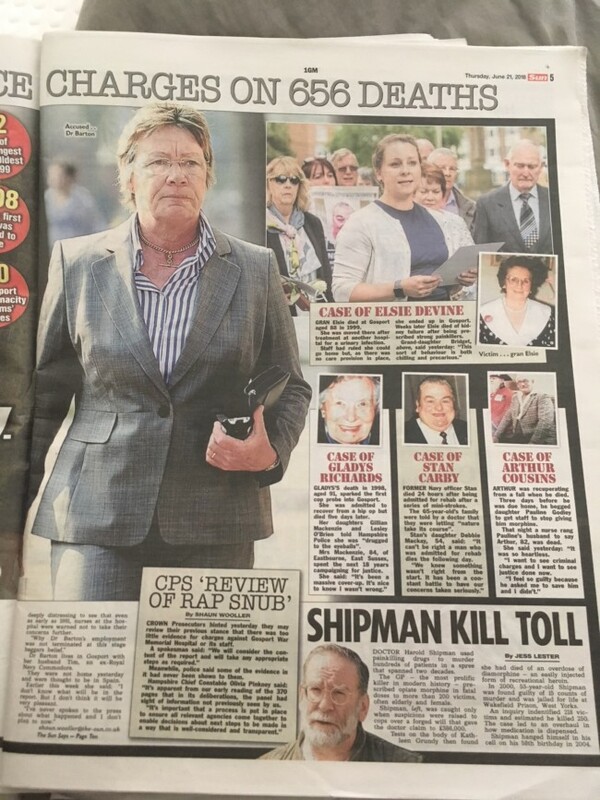 On pages 6 to 11, Mail readers hear more of the “deadliest coverup”. One fact seems notable above others: in 2010 the GMC found Dr Barton guilty of misconduct and that she prescribed “potentially hazardous” amounts of drugs. She retained her licence to practice medicine. The Mail says she was made the subject of sanctions, one being that she could not prescribe opiates for three years. 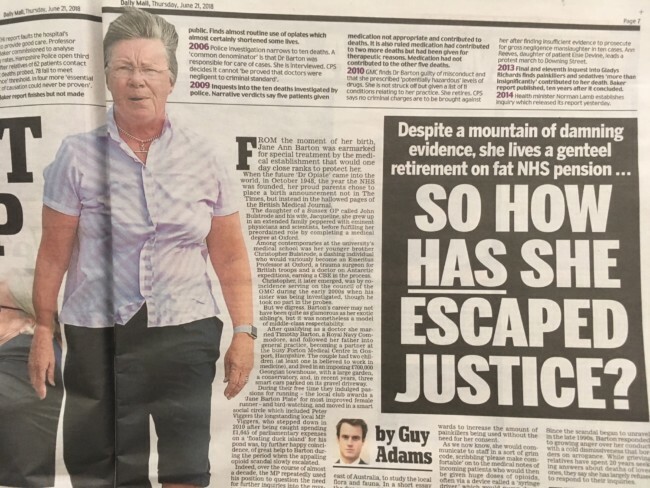 In March 2010 Dr Barton retired on a “fat” pension. We’re not being invited to sympathise with Dr Barton. But what we crave are facts. But the papers can’t get the most basic of those right. 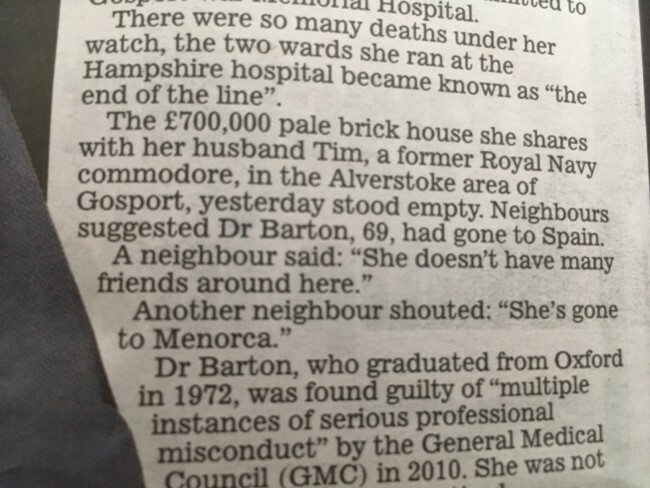 The Mail says Dr Barton is 69. The Sun says she’s 70. 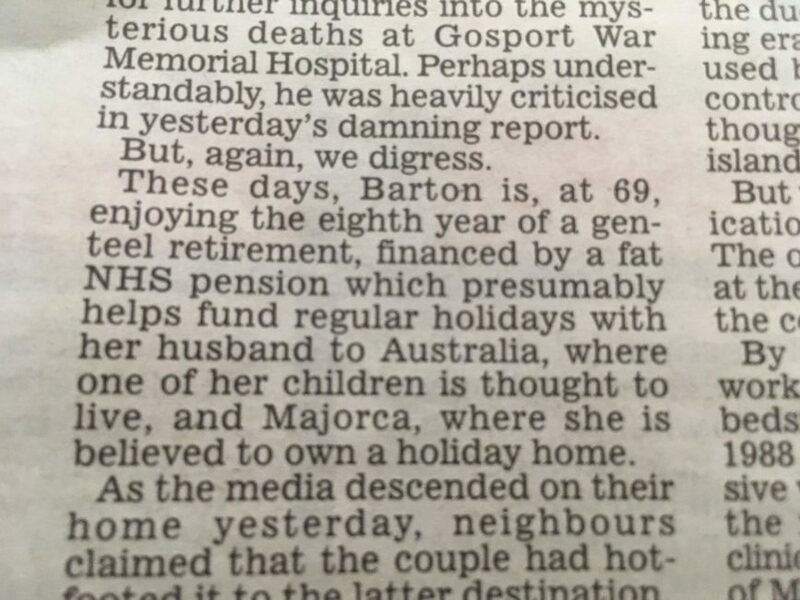 The Mail says she is in Menorca. The Express says she’s in Majorca. 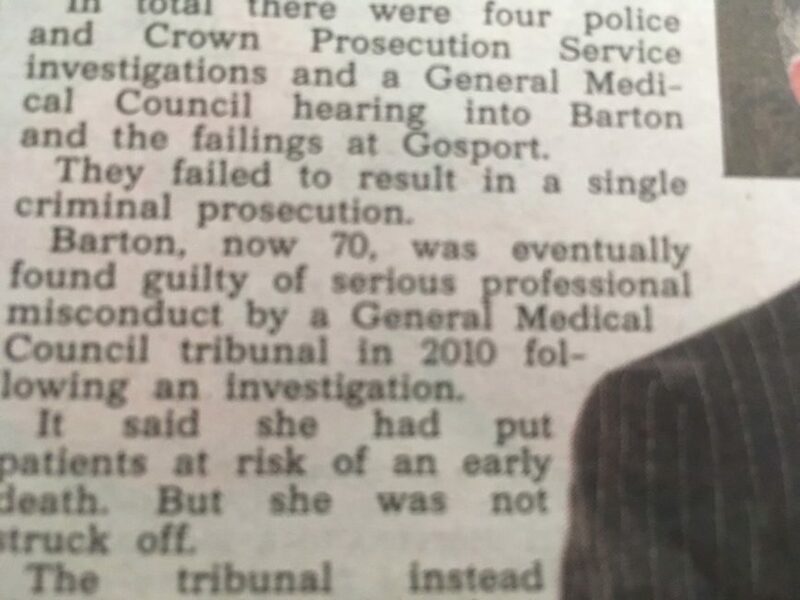 It’s worth noting that Dr Barton has not been charged with any criminal offence – ever. But you know who has… Yep. 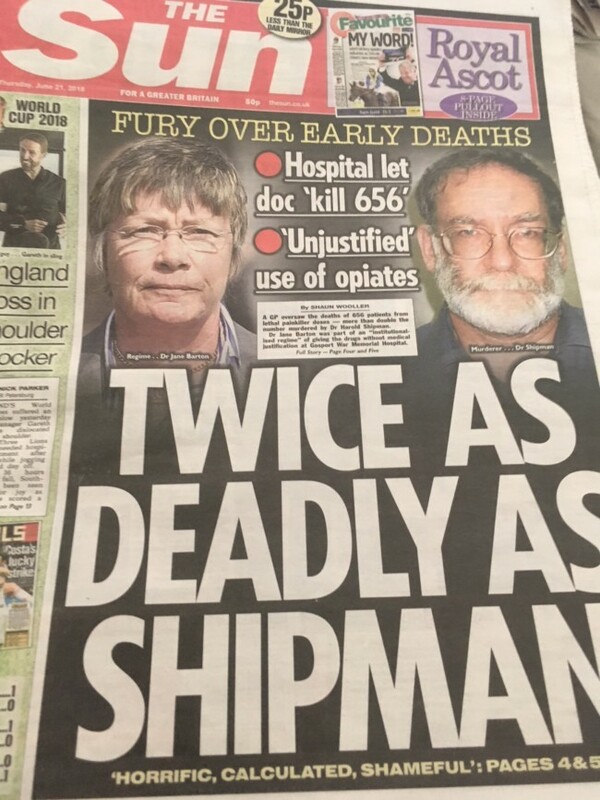 Dr Harold Shipman.